This book has been hailed as the ‘best Jack Reacher yet’ which is a very high accolade indeed. 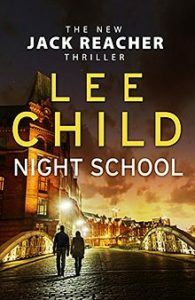 Night School is the 21st novel in the Jack Reacher series; all be it a prequel set in 1996 when Reacher is just 35 years of age. I’m not going to lie to you; it is a good one. A book I enjoyed immensely. Easy to pick up and read anywhere, anytime. Lee Child is a master at working in time limits to his work, and this book is no different, in fact, Child sets the timer running at the beginning of the novel. Admittedly we, the reader do not know the time limit but then neither do Reacher or the team he is working with, and this adds immensely to the drama and allows for a fast paced, action packed novel, all be it one with intricate levels of detail. Reacher, fresh from a medal winning mission, is sent back to school. But in true Jack Reacher style this is no ordinary school, set in 1996, Night school harks back to the pre 9/11 days when intelligence agencies in the US were suspicious of each other and cooperation was at an all time low. Add to that their deep rooted suspicion of every other country and their intelligence agencies. There was none of this inter-agency coordination or cooperation, and Reacher has to cross these lines and force cooperation both inter-organisationally and internationally in order to deal with the threat of weapons falling into the wrong hands in a foreign country. By novel 21, you would expect Child to have a greater understanding of the inner workings of his character, and this book does not disappoint, I’m almost jealous of the relationship that Child has with Reacher, it’s as though Reacher writes himself. Not once do you question the authenticity of a response or a reaction, nor do you question his motive. You believe that Reacher is a real man whom Child knows and who has recounted his story to be laid bare on the page, in a way it’s as if Reacher guides Child through the story and not the other way around. I find that all good Reacher stories are just a ‘day in the life’ kind of view of his life. Night School is no different; although the events which unfold are the workings of a great Thriller or Action movie, not once do you question why and how these things are happening to him. Child’s natural way with language and the familiarity with the character make this story completely believable, in spite of the sometimes crazy situations which the character gets himself into, and makes this book a delight to read. And don’t worry if you haven’t read any of Lee Child’s previous work; each Jack Reacher book can be read alone. Sure it helps to know Reacher’s motivation in certain scenarios, but Child keeps the back story references to a minimum and fully explains to the reader any elements that may be relevant and necessary to know, as and when they occur. I myself have only read 3 of the 21 in this series, but would not shy away from picking up any of those 21 books and reading them out of order. It is a testament to Child’s talent that he can not only produce a massively successful series of books, of which two have been made into successful blockbusters; also that he does not isolate his audience by assuming pre-knowledge of the character. For what? Who from? It’s 1996, and the Soviets are long gone. But now there’s a new enemy. In an apartment in Hamburg, a group of smartly dressed young Saudis are planning something big. Jack Reacher is fresh off a secret mission. The army pats him on the back and gives him a medal. And then they send him back to school. A school with only three students: Reacher, an FBI agent, and a CIA analyst. Their assignment? To find that American. And what he’s selling. Night School takes Reacher back to his army days, but this time he’s not in uniform. With trusted sergeant Frances Neagley at his side, he must carry the fate of the world on his shoulders, in a wired, fiendishly clever new adventure that will make the cold sweat trickle down your spine. Of course, it is Reacher who excels at school and makes headway in uncovering the plot and bringing down the bad guy. While the others get bogged down in bureaucracy, it is Reacher’s forward planning and ‘thinking outside the box’ which saves the day, with of course a little help from his friends and fellow class mates. Come on you knew it was going to end well, no spoilers there. My version of the book also included the first three chapters of ‘The Midnight Line’ due out November 2017, and I have to say, I’m hooked already. It is already on my pre-order list, just in time for Christmas. As well as a short essay by Child himself, which I have to say I found very sobering after the excitement of the last few chapters of the book. A poignant message about story telling and fiction through the ages. I’m not going to lie; the guy does have a point here. Being British and so not really overtly represented in the cast list for this book, and also perhaps because I read an awful lot of American authors and so don’t find this level of patriotism to be unfamiliar; I wasn’t really affected by this over patriotism to the USA. However, after reading this review and looking back, I can certainly see what he means. The Germans are portrayed in a rather sinister light at points with their ‘smarts’ being undermined at every turn (well almost every turn). Strange though that this level of patriotism to the USA be so vivid as Lee Child himself in actually British, all be it now living in America, perhaps Reacher’s voice was a little too loud for Child to ignore on this point. I would recommend as a good read. Pick up and put down anywhere anytime. It was my ‘read in the bath’ novel of the month. No scary house ‘breaking and entering’ scenes so safe to read alone. Fast paced so easy to glide from chapter to chapter and lose yourself for a few hours of self-indulgence. Not a great work of art but a well-orchestrated story and character development. A good plot which seemed to be quite water tight. A little over patriotic to the USA but hey it’s a book about US military, there was bound to be a bit of peacocking going on.